One of our most popular drafting chairs! The Chiroform mid back ergonomic drafting chair from Allseating features an ergonomically contoured foam padded backrest and a contoured foam padded seat cushion with waterfall seat edge, pneumatic seat height adjustment, 360-degree swivel, height adjustable t-shape task arms, chrome finish foot rest and a heavy duty five star nylon base with dual wheel carpet casters standard. Optional hard floor, stationary or braking casters available for a minimal charge. 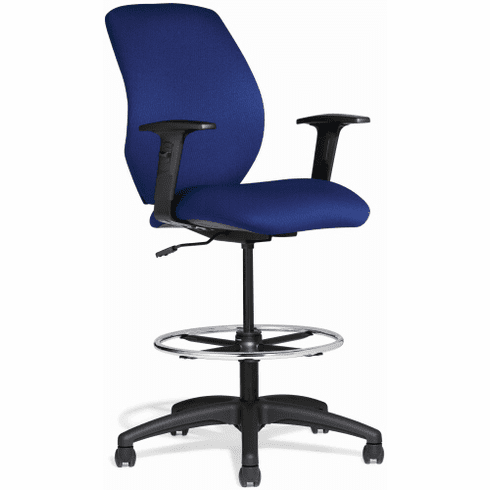 The Chiroform chair is also available with an optional posture back control that allows for backrest height and angle adjustments. The Chiroform drafting chair meets or exceeds ANSI/BIFMA standards and can hold up to 325 lbs. Dimensions: Back Size: 20"H x 18"W. Seat Size: 21"W x 19"D. Seat Height Adjustment: 18.5" - 26"H. Overall: 38.5" - 46"H x 28"W x 28"D. 10 year warranty from Allseating. Normally ships in 3-4 business days from Toronto CA. This chair is pictured in Elements Indigo.